Ali Abu Awad, one of the founders of the Bereaved Family Forum, is an inspirational, reconciliatory figure for Dr Fathieh Saudi. Born into a prominent Palestinian family he saw his mother imprisoned by the Israeli prisons for resisting the occupation. He himself was imprisoned and wounded. When he was recovering from wounds in a Saudi hospital he heard that his brother had been killed by a Jewish settler. From that time he realised that violent conflict was not going to be successful. He sought to overcome revenge even though he did not feel warmth or affection for Israelis he felt the urgency to set bitterness aside and seek to build bridges. One of the people she interviewed was Avraham Shomroni, an Israeli who’s very active in the Parents’ Circle-Family Forum. Avraham was born in Vienna and was one of the 10,000 Jewish Kindertransport (children’s transport) children, brought to safety in Britain between 1939 - 1940. His parents sadly perished in Auschwitz and Dachau. He went to boarding school in Yorkshire and studied hard before working for Dunlop, before emigrating to Israel in 1953. His 20 year old son, Jonathan, was a talented trainee pilot. He shot in 1974. He had always been tolerant and pro-peace and Avraham felt the best way to honour his memory was to join the Parents’ Circle. He’s still active fifteen years later, giving talks to young Israelis before they are conscripted into the army, about the need for understanding and tolerance towards the Palestinians. * “The Third Symbol” will be published in 2012. Annette’s first book “An Ethiopian Odyssey” –a quest to find some former classmates from her schooldays there, sold in 21 countries. http://www.anethiopianodyssey.com As before, she will be donating half the royalties from her second book to help fund water projects – in Ethiopia and Gaza. She feels that it is important to do good deeds to challenge the darkness in the world. Alex Ntung had the misfortune to be involved in three nations where there were massacres during his stay but he was not threatened because he did not look as if he was from a particular tribe. In the aftermath of the Rwanda massacres there is a need for reconciliation. Up to 120,000 Hutus are accused of war crimes. So far the International Criminal Court has tried only 45 individuals. This will take 160 years to complete at this rate. The Rwanda Government, United Nations and Civil Society are examining different ways to solve this problem so that the nation can move forward. This is held back by the need for many families who cannot find their relatives remains to bury and mourn for them. The general experience of those seeking reconciliation is that confession is very powerful for healing of both the perpetrators and the victim’s families. Rwandan communities are looking at Truth and Reconciliation Committee style process to be able to create a new future. Sadly many Truth and Reconciliation committees have failed because they were imposed on the communities rather than developing from the grassroots with a sense of local ownership. In the Democratic Republic of Congo (DRC) there have been so many massacres. So many groups have emerged in opposition to the Government because they wanted to be included in the negotiations for both a treaty that resolves the conflict but also for the elections that will follow peace. 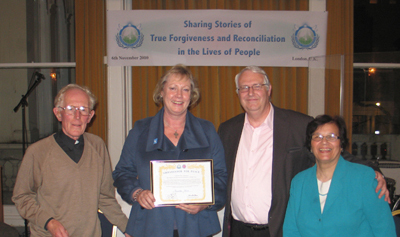 Christian groups are working to bring communities forward before truth and reconciliation committees are imposed by others. The Lendu and Hema communities came together to review how the conflict was started and it has worked in bringing reconciliation amazingly. Shukhbir Singh, a member of GNNSJ, shared that Africans can get angry and do horrible things but there is also a capacity in Africans for reconciliation that is lacking in Indian subcontinent or in the UK. There are so many levels of conflict in the aftermath of Rwanda genocide. The Hutus suffered because they were suspected of involvement. Returning Tutsis took over empty houses often belonging to Hutus when they returned from the forests after the massacres but when the owners returned there were many more problems that took 10 years to resolve. Quincy Garcia shared how he had sold drugs and has been to prison several times. Hi father had also been in prison several times so he grew up with the experience of visiting prison. He took the opportunity of the experience of being imprisoned to change his life around. Through film and telling stories he was able to transform his life from being a drug dealer to a documentary maker. Roshan Ahmed shared about her relationship with one of her children. She had struggled to overcome the strong nature of her child. She had many suppressed painful emotions. She acknowledged the cause of the pain and began to confront the situation and start afresh. The transformation came within herself first. Then she could talk to her child about it openly. It was largely miscommunication and other issues which could be resolved by talking and discussing honestly. Dina Mandalia shared about her victory in overcoming divorce and reconciling with her former husband. He eventually came back to live in the same house in order to redecorate the house and sell it at a higher price for their mutual benefit. She felt that her religious belief compelled her to forgive her husband and see it as her Karma. Kemal Pervanic, a Muslim from what is now Bosnia, used to live in Yugoslavia. The life used to be wonderful living together in harmony between ethnic/religious groups, but this was abused by politicians who exploited their differences. He was in a prison camp where people were tortured and raped. He did not know whether he would live or die. He struggled so much afterwards. He came to realise that he was asking the wrong questions. He imagines how it would feel to kill the people who did those terrible things. He overcame those thoughts realising that it would destroy his character. He returned to Bosnia after a 10 year gap. He tried to forgive the perpetrators. He tried to generalise the human situation to all conflicts. He spoke to his teacher, who he had previously respected, and who had interrogated him in the camp. The Teacher wanted to be forgiven but did not want to take responsibility for his bad actions. That relationship could not be resolved. 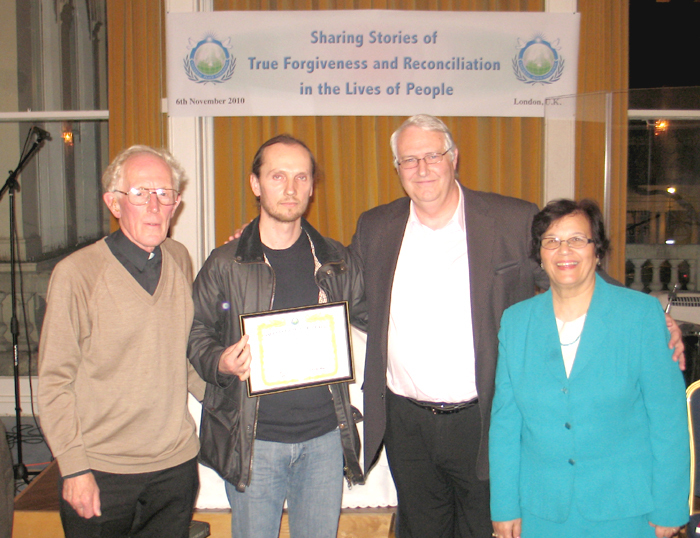 Ambassador for Peace awards were presented to Annette Allen, Kemal Pervanic and Quince Garcia.